In Burma, two journalists from the Reuters news agency have entered their third month in jail. Wa Lone and Kyaw Soe Oo were arrested on December 12 and charged with violating Burma’s Official Secrets Act. They have been denied bail and face up to 14 years in jail. In Burma, two journalists from the Reuters news agency have entered their third month in jail. 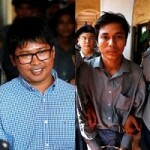 Wa Lone and Kyaw Soe Oo were arrested on December 12 and charged with violating Burma’s Official Secrets Act. They have been denied bail and face up to 14 years in jail. At the time of their arrest, they were investigating a massacre committed by the Burmese military targeting Rohingya Muslims in the village of Inn Din in September. While the two journalists remain in prison, other journalists with Reuters have continued to piece together what happened in Inn Din. In a shocking new exposé, Reuters reports Burmese soldiers and members of an informal militia executed 10 Rohingya Muslim captives. At least two of the men were hacked to death. The others were shot. Lawmakers on Capitol Hill are continuing to debate the future of DACA, the Obama-era Deferred Action for Childhood Arrivals program, which gives some 800,000 young undocumented immigrants permission to live and work in the United States. Republican lawmakers are pushing to include an amendment to punish so-called sanctuary cities as part of any immigration legislation to protect DREAMers. Meanwhile, a second federal judge has temporarily blocked the Trump administration from canceling DACA. On Tuesday, Judge Nicholas Garaufis in New York issued an injunction to keep the program temporarily in place, warning its cancellation would have “profound and irreversible” social costs, writing, “It is impossible to understand the full consequences of a decision of this magnitude.” For more, we speak with Rep. Pramila Jayapal (D-WA), vice ranking member of the House Budget Committee and vice chair of the Congressional Progressive Caucus. Rep. Pramila Jayapal talks about the scandal embroiling the White House over former Staff Secretary Rob Porter, who resigned after evidence surfaced that he had abused his two ex-wives. On Tuesday, FBI Director Christopher Wray testified to the Senate that the FBI had told the White House about the physical and verbal abuse allegations that were holding up Porter’s background check months earlier than the White House has admitted. Jayapal talks about why she has called for White House Chief of Staff John Kelly to resign, as well as her support for impeachment proceedings against Trump.